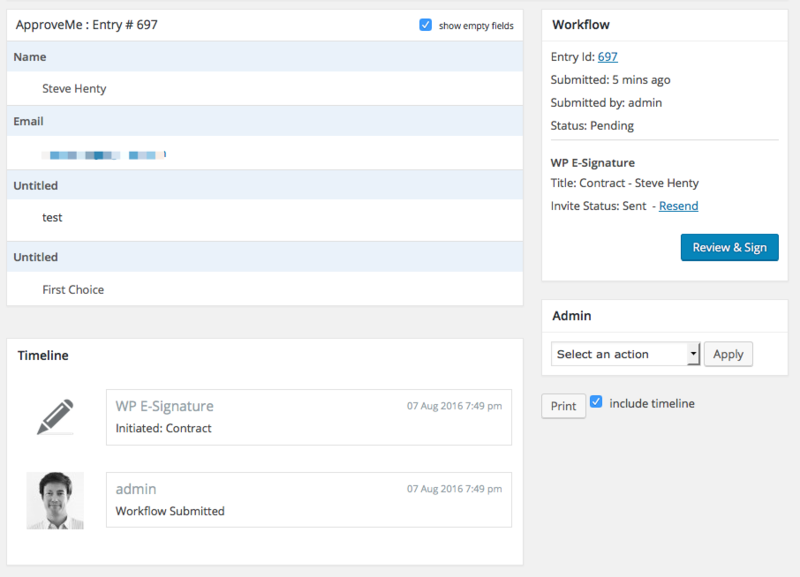 Gravity Flow includes built-in support for the WP E-Signature plugin by ApproveMe. 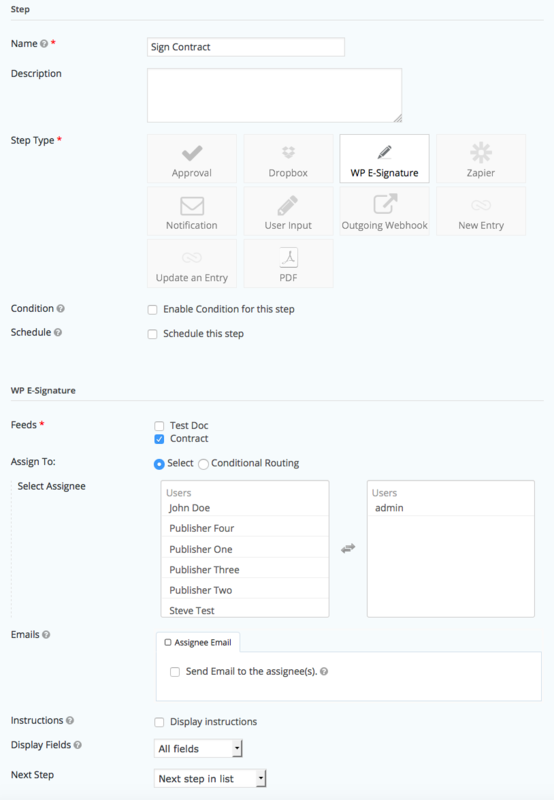 Administrators can add workflow steps at any point in the process to collect legally binding document signatures using the WP E-Signature plugin by ApproveMe. WP E-Signature plugin by ApproveMe (business license) plus the Stand Alone documents add-on. 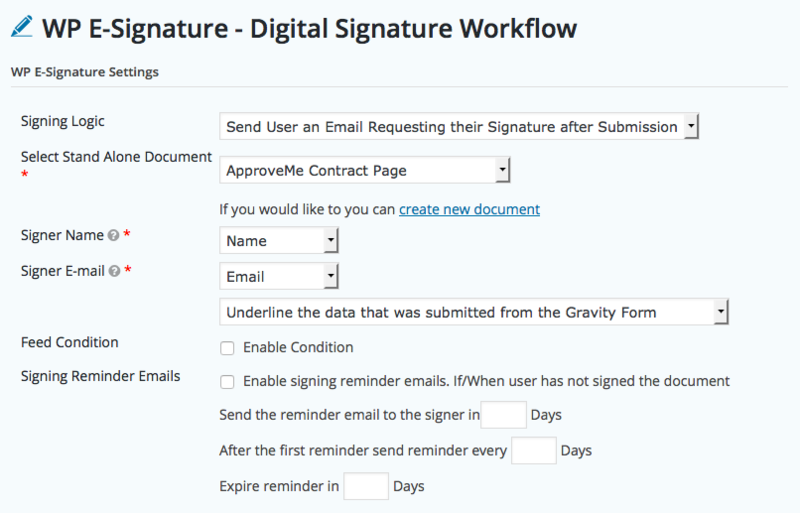 Set up the Gravity Forms Signature Add-On by ApproveMe plugin following their installation instructions. Test the form by submitting an entry for signature. Once all the above is installed, configured and working then you're ready to add your workflow step. You can add a signature step at any point in the workflow. For example, you might want to collect the signature in the middle of a workflow after some user input and approval steps and then end the process perhaps with a PayPal payment step. When you select the WP E-Signature step type the settings will appear below. The settings allow you to select the assignees, configure an assignee email, display instructions, select the display fields and select the next step just as you would for any workflow step. When the assignee opens the entry detail page from the inbox he/she will see the invitation status in the workflow box and the "Review & Sign" button. The button will open a new window with the standalone document ready to sign. The step will complete immediately after the document is signed. The "Review & Sign" button will only appear if the email address of the step assignee is the same as the email address of the document signer defined by the Signer E-mail setting in the WP E-Signature feed settings (see above). If the email address of the assignee is different to the document signer email address then the 'Preview' button will be displayed. The Preview button will open the standalone document but it will not be possible to sign the document. This allows users to be assigned to the step in order to oversee the signing process. For example, a sales person can be assigned to the step along with the client. The client will be able to sign the document and the salesperson will see the entry in the inbox, check the status of the signature and resend the invitation (requires permissions to open the WP E-Signature plugin settings). 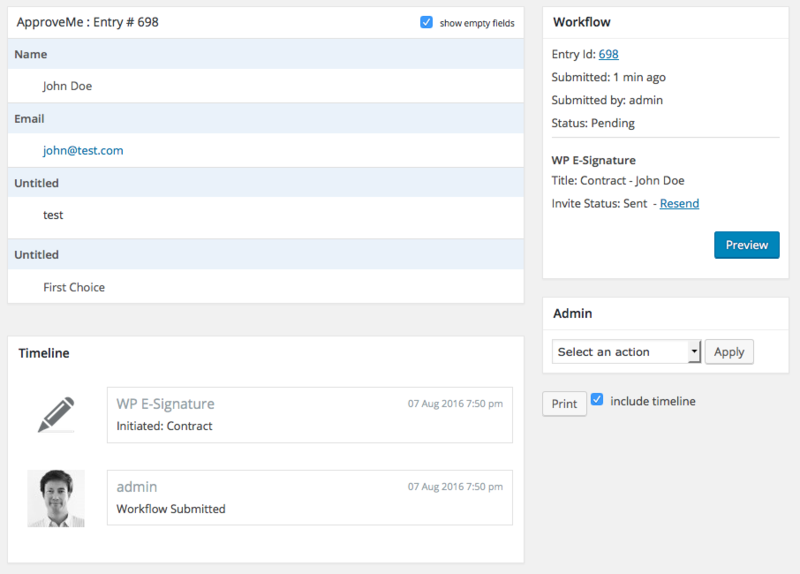 The WP E-Signature step was added in Gravity Flow 1.4.